The bunch of grapes has long been something of a painter’s emblem. Since the time of Zeuxis’ legendary painting (so convincing that birds flew down and tried to eat them) the bunch of grapes has tested a painter’s mastery of chiaroscuro, colouring and realism. It is a test to which I have often returned. Because grapes are translucent, even a single grape is optically complex: light hitting it is divided; shorter wavelengths are scattered at the surface – giving the lights a bluish, cool quality enhanced by the dusty bloom – while longer wavelengths penetrate the flesh and are transmitted through it, so that a warm glow emanates from the interior on the shadowed side. It is thus, in miniature, an object-lesson in the principles of colouring and chiaroscuro as these were understood by masters like Titian and Rembrandt; it is precisely this play of cool lights against an ambience of warm shadow that is so distinctive of their work. Looking beyond the individual grape, the bunch displays an order in which the relation of the elements is not harshly imposed or rigidly geometrical but apparently casual, spontaneous, organic. Every grape in the cluster gently influences and accommodates its neighbours. This ‘unity in the manifold’, this principle of harmony and natural beauty, can stand as much for an ethical ideal as a model of colouring and composition. 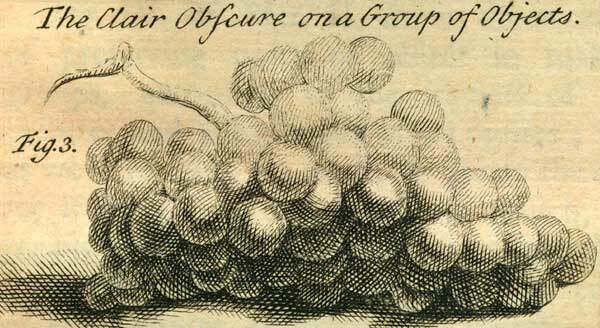 When giving roundness to a group, the best and finest rule to be had is that of a cluster of grapes, that Titian used to follow. 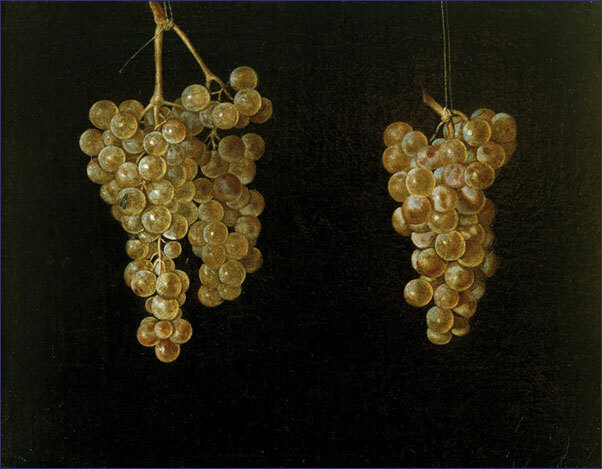 As within a bunch there are grapes that are lit and others that are in shade and some in the middle which are half-lit, in the same way this master wanted his figures to be arranged in a group using chiaroscuro, so that these different objects seemed to be one. 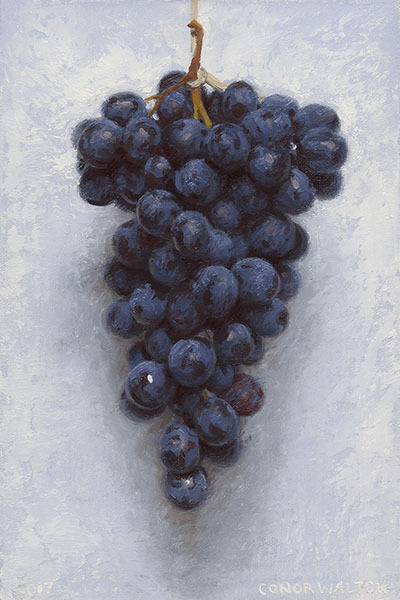 I have tried to keep this rule in my own work, and returned often to the bunch of grapes itself as subject, both to reaffirm first principles and to experiment with different ways of looking at the object and describing it in paint. Indeed, such simple studies have been critical to the development of my technique, often sustaining my faith in painting when facing what sometimes seem like insuperable obstacles in larger and more ambitious compositions. This is my excuse for what may otherwise seem an excessively literal observance of Titian’s advice: these small grape-paintings, like the ‘spiritual exercises’ of old, are both meditations and acts of faith. Almost compositionless, they offer the perennial challenge to find, through artifice, an equivalent for nature’s artlessness. In my early forays I took Dutch and Spanish still-life painters of the seventeenth century, such as Juan Fernández, El Labrador, and Jan Davidz de Heem, as my models. The starting point was a detailed drawing in which each grape was delineated; the whole bunch was then painted more-or-less grape by grape, glazed and then repainted again and again to achieve greater depths of colour and realism. More recently, I have pursued a more synthetic, less piecemeal approach. Instead of starting from individual grapes, the bunch itself has been my starting point, first indicated as a large ‘splodge’ of thick colour, then roughly shaped and refined with smaller splodges. Instead of relying on a long methodical process to reach the end, I try to paint the whole cluster at once, so to speak, and as quickly and spontaneously as possible. The calligraphy of open brushwork that results from such an approach, though it appears rough and messy upon close scrutiny, from a distance can be more convincingly ‘natural’ than a smoothly finished surface: bolder marks enhance the drama of light and the physical presence of the painted cluster. Instead of treating each grape as bounded by a continuous contour, line is avoided almost entirely, leaving the viewer’s imagination to supply the missing boundaries. The absent or ‘broken’ contours emphasise the unity of the cluster by interconnecting the grapes, making colour ‘flow’ between them, embedding them in an atmosphere that can appear almost liquid in its density. Canvas and cluster are placed side-by-side so that I can apprehend both in the same glance. 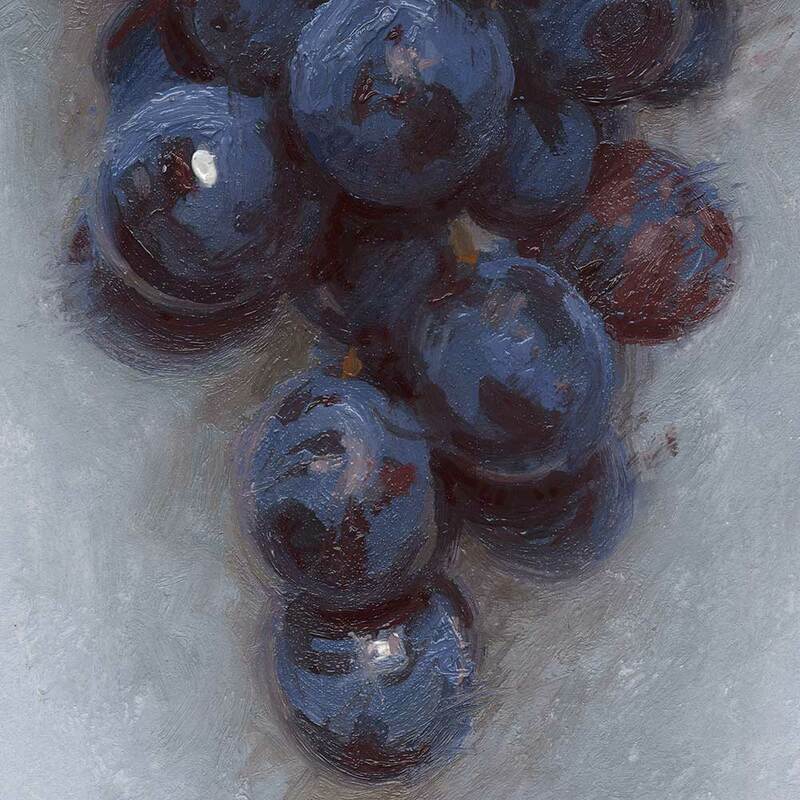 Painting at arm’s length with long-handled brushes, I quickly flesh out the form of the cluster, trying to get the painting to match real grapes in overall visual effect. There is a moment, maybe ten or fifteen strokes in, where the little painting has the potential to be something marvellous, a miracle of atmosphere, economy and truth. There usually follows a prolonged panic as I struggle to advance the painting without undermining that early promise, and I have to hope that the god of painting will lead me not into a floundering mess but deliver instead a sublime improvisation – a glorious ‘accident’. In the end there are quite a few messes (though you’ll never see the worst of those), and none fulfil their early promise, but occasionally something happens that’s still a positive surprise – to me at least. How did that happen? Can I do it again? I’ll have to try!